Hou Yifan during her successful title defense last year. Photo by Anastasiya Karlovich for FIDE. Hou Yifan has been the topic of discussion ever since she burst onto the chess scene as a promising phenom. Hou is now 18 and has already trod a progressive path to make her mark in chess history. She successfully defended her world title against Koneru Humpy in 2011 and has now begun to venture out into more competitive tournaments. Her stunning performance in Gibraltar (2872 performance) created a buzz that has not been seen in the women’s world since a young trio of sisters were taking the chess world by storm in what was deemed an experiment. The Polgar sisters, Zsuzsa, Zsophia and Judit, all developed into powerful examples of gender equality in chess. In a world where women are mostly competing in much weaker segregated tournaments, the Polgar sisters created the idea that they could compete on equal terms. Judit Polgar has proven herself in a sport dominated by men. There were famous episodes of Judit Polgar bringing her teddy bear to the board. While the older men were enchanted by this sight, they were soon dismayed when they ended up on the receiving end of a brutal checkmate. She would become famous for her remark, “I kerrushed him.” Thus, Polgar emerged as a “wunderkind” after her string of devastating wins. At age twelve, she was already 2555 and already into the top 100 players. She then rose rapidly largely eschewing women’s tournaments for the more competitive open tournaments. Polgar rose to the 2700 class in 2003 and peaked at 2735 ELO two years later (#8 in the world). She is now #29 at 2709. Polgar is widely considered the strongest woman to ever play chess and has compiled a stellar resume. Hou Yifan has created some distance between her and the players like Koneru Humpy the only other woman to make 2600. Photo by Anastasiya Karlovich for FIDE. With Hou’s recent success, there have been some comparisons made with Polgar. Of course Hou’s improvement trajectory was different in that she has subsisted primarily on women’s tournaments. Over time, she began to distance herself from her 2400-2500 ELO opponents and finally broached the 2600 barrier. In the last year, she broke the 2600 barrier, defended her women’s crown, tumbled almost 40 ELO points, rebounded and began to make more appearances in the strongest tournaments she could find. Her breakthrough came when she attended the Tradewise Gibraltar Masters and scored 8/10 (+7 -1 =2; TPR 2872) beating along the way: Zoltan Almasi (2717), Judit Polgar (2710), Le Quang Liem (2714) and Alexei Shirov (2710). Her win against Polgar was a highly-anticipated battle and started rumours about a potential unofficial match. There was actually a match announced, but that notion was refuted by Polgar herself. 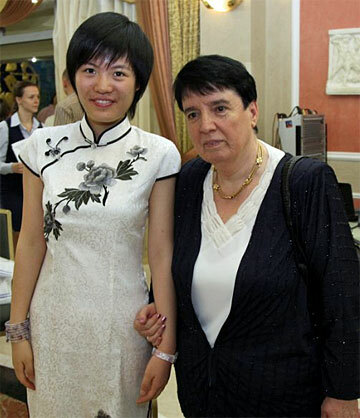 Women’s World Champion Hou Yifan looks ravishing here with the admiring Nona Gaprindashvili, Women’s World Champion 1962-1978. The two players representing the the best of different eras. The discussions buzzing on chess blogs and Facebook pages pertain to whether Hou Yifan will one day eclipse Judit Polgar as the “strongest women ever”. 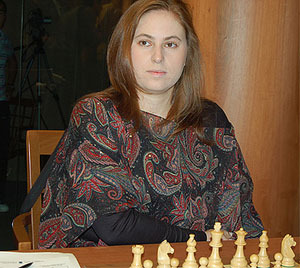 Many references were made of Vera Menchik and Nona Gaprindashvili and Maia Chiburdanidze, but none of these women made the stand that Polgar has made against the strongest competition. However, Hou’s performance in Gibraltar and following performance in Reykjavik are signs that she has closed the strength gap with Polgar. Hou pending rise has chess fans and pundits anticipating what could be a rivalry, but with Polgar in the sunset of her career and balancing motherhood, it is unclear on how long she will continue her international career. In the final analysis, Polgar’s rise as a child prodigy and her early and sustained success against the strongest competition has given her a status that not even Hou Yifan will be able to claim. It is however inevitable that the Chinese sensation stands to eclipse 2700 and threaten Polgar’s record of 2735. Surpassing Polgar’s stellar history would require a sustained effort. Looking at Chinese women’s champions (Xie Jun, Zhu Chen and Xu Yuhua), they all aborted chess careers to raise families and pursue additional education in their late twenties and early 30s. It is too early to tell whether this will become a factor. China may make an attempt to provide their champion with all the help she needs in achieving her goal of becoming an elite player. If there is an Polgar-Hou “strongest argument” made at some point in the future, it would most likely take into account the improvement trajectory, rating peak (accounting for inflation), ranking peak, longevity, head-to-head score, quality of games, overall record in strong tournaments and perhaps other variables. Hou may be at quite a disadvantage since she started her foray into elite chess several years later than Polgar. As of today, Hou is just outside of the top 100 at 2639. To give a perspective, Brazil’s Henrique Mecking was #3 in the world at 2635 in 1977. It will be important for her to draw from the deep pool of strong players today. If she continues to play the bulk of her chess in women’s tournaments, her rating will stagnate since even draws will hurt her attempts to rise up the ELO list. 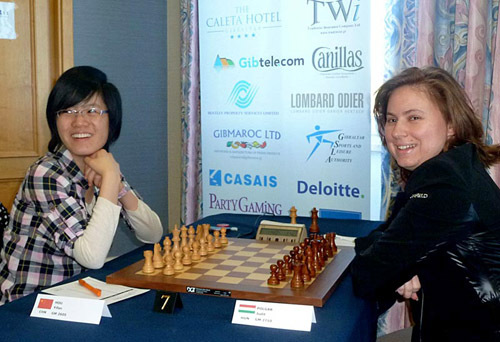 Hou Yifan Hou Yifan facing Judit Polgar in a historic battle at the 2012 Tradewise Gibraltar Masters. Photo by Zeljka Malobabic © Tradewise Insurance Ltd. There have been no statements made of her intentions, but Hou’s developments will be followed with great interest. While Polgar refuted claims of a pending match, she did not seem adverse to the idea. Perhaps it would be dubbed “The Match of the Century”. There would presumably be numerous options for sponsorship. In the meantime, it may simply be best for Hou to follow Polgar’s path and prove herself as one of the world’s strongest, regardless of gender. Polgar has proven it can be done. All other accolades will fall into place thereafter. Judit Polgar recently said that Hou Yifan is the only other women she sees who can make 2700. She cited youth as a factor. There is *no* difference in ability level between someone who is ranked at, say, 2350, and somebody who is ranked 2700. Or at least, very little. Think about it. I would imagine that someone with a FIDE ranking of 2350 has an I.Q. of 150 or 160. For whatever that’s worth. What do you think would be the I.Q. of somebody with a rank of 2700? Admittedly some may have an I.Q. of 180 – but in general, I would guess – – 150 to 160. Knowledge of the game? C’mon – – do you really think there’s any “secrets” that a 2700 player knows that are as-yet undiscovered by somebody ranked 2350? A difference in attention span? Memory? Visualization of the board? Persistence and dedication? Some sort of magical cognitive trick they’ve discovered? I doubt it, personally. Granted there may be *some* difference in ability level, I mean, clearly there’s *some* difference in ability. My claim is that it’s not as drastic a difference as one might imagine. That would leave – – – luck. Who one happens to be matched against. Face it, sometimes if there’s two equally-matched players, one of them may go against a weaker player at the same time that the other goes against a stronger one. (Or one who’s having a good day.) And then again, and again, and again. And that of course would inevitably be a confidence builder for the one who does better. Do that a few times in a row and all of a sudden one is ranked at 2700 and is a “super-genius” of Chess while the other is “only” ranked 2350. Nothing against Yifan Hou or any other “strong” Chess player. Just something to consider. Unfortunately, there is no way to associate chess strength with one’s IQ. Chess does not depend on raw intelligence and those who excel have varying levels of intelligence from functionally illiterates to geniuses. Chess players are are good at an number of cognitive functions such as pattern recognition and visualization. Mastery of chess does not imply that one is “smart” although it is often perceived this way. WELL I REALLY WASN’T SURE UNTIL SEEING HER LAST TWO TOURNEY RESULTS – AND HAVING A WINNING POSITION AGAINST CARUANA. I THINK SHE COULD DEFINITELY BE IN THE TOP 50 IN THE NEXT FEW YEARS. AS GOOD AS JUDIT? THAT’S TOUGH TO TELL RIGHT NOW. Yep… it’s hard to know. Hou remains an intrigue. She does not say much in her interviews. As her English improves, we may get more of an idea. Her playing style is not quite as aggressive as Polgar’s, but she is relentless on the attack as well. I believe GM Ye Jiangchuan is still the national trainer, so it will be interesting to see how the federation schedules her tournaments. Since she has scored well, players will prepare more thoroughly. Looking at Judit’s games they were very energetic and without compromise. The variations were rich with ideas. She was always looking for ways to create problems with relentless pressure. Opponents usually panicked and she’d spring a knockout combination. Judit is like a predator and according one observer, she intimidated with her piercing eyes and flowing auburn hair. This would be an interesting match. There is a pool large enough for Hou Yifan to reach 2700 without much of a problem. Unlike 25 years ago when there were only three 2700s, now there are close to 50. Today’s 2800 seems to be the 2700 of 25 years ago. There are three 2800s today. Will it take 25 years to get to 50 2800s?? I believe Hou can make it to at least 2725. Hou should aim for the stars to reach the moon. But the raw talent is there, for sure. Hou Yifan score in the bottom tier of the recent Chinese Chess Championships won by Ding Liren. She lost a healthy amount of ELO in losses to two 2400-2500 level players, but still stands to gain about 30 ELO points in the next FIDE list. Hard to see her blazing the fast path up to 2700, but hopefully she continues to play the strongest competition. Why that frantic hurry? Yifan is just 18. She has lost her childhood and youth for what we call success. To stabilize her development she needs first of all the ‘normal’ life of a young woman. Otherwise she will follow the other Chinese players in giving up everything to marry and to spend her time with a child and some education. Yifan is such a wonderful person with her charisma, her intelligence, and her natural beauty. To respect her is not only looking at her titles and ratings, it is the wish that she finds her way as a young woman. I believe the issue is whether she will overtake Judit Polgar. The Polgar sisters all had the lives of “child prodigies” as well and they are all successfully married with families. Judit still reached a high level in chess while making sacrifices. What is a normal life? Yifan is doing what is normal for her… enjoying what she does best. If not chess, she may be doing some other hobby or “normal” activity. Yes… Yifan has all the attributes you mentioned… charm, intelligence and beautiful. She is also a chess talent we have not seen since Polgar. She has more potential than her Chinese predecessors… she is younger, stronger and thus has more potential to reach 2700. There is no question that she can attend the university and get married… normality, but whether she can scale the highest heights of the chess elite is another question. She can and she will, I am sure. I am convinced that she has more potential than Judit Polgar. But it should happen as the result of a natural process. Otherwise she suddenly will give up at one or the other point of the journey. To succeed as a sportswoman is one thing, but to succeed as a human being is something else and more important. What I try to highlight is that she needs the balance of both. There is no need to put pressure on her from outside. She is very ambitious and as a part of the Chinese system she rather needs people to slow her a down. However, I am deeply impressed by the circumstances of her life, the whole story with her parents, especially with her Mom. May she be well and protected whatever she does and wherever she goes. Yifan’s mother is wonderful. The fact that they moved from her hometown to pursue her chess dreams is something that is not often seen. My point was that Hou Yifan can achieve both high level and all her other interests such as raising a family. She has not lost her childhood, but is simply doing something meaningful and at a much higher level than what teens normally accomplish in their activities. However, there is a small window to move into the elite level and compete consistently at against the top players. she cannot simply take her time since competition is much tougher now. Unfortunately, she has fared poorly in three events since her spectacular result in Reykjavik (Chinese Nationals, Bangkok and now Hainan Danzhou). Measuring potential is subjective. I’m not sure how you measure that Hou Yifan has more potential. Judit made top 100 when before age 13 and had begun playing consistently in elite events by 15. It is a difficult comparison. We will have to give her a few years to see where she is. Can you compare the strength of the players when Judit was 13 with today? But of course my estimation is subjective. I have a lot of trust in Yifan because I am completely under the charm of the fairy tale of this family. I think that her mother sees the problem of one-sidedness and imbalance too. She will help her to find a way. We are looking from two different angles on the same thing. We both want to see her happy, successful and balanced. You think that she must push constantly to achieve something. But maybe you focus too much on success, ratings and titles. She is not a computer that plays every day with the same strength. I would like to see the whole process more relaxed, sometimes looking in the opposite direction like a beginner, never becoming a narrow-minded specialist. I am sure that this is the way to real success as a chess player and as a human being. But this is also subjective like every view and standpoint. As a monk I could add that from a higher standpoint all these words are empty and meaningless, but that would probably be the wrong message in the wrong place. There are ways to adjust for rating inflation that has occurred in chess. When Judit was 12, there were only a few 2700-rated players. Now there are 50. Statistician Jeff Sonas has actually taken the time to rate players from the 19th century and compare them to today’s players. It’s not perfect measure, but it allows these inevitable comparisons. Yes… we will have to wait and see how she does in time. I am familiar with Hou Yifan’s story and have watched her the past 6-7 years. I have also seen and photographed her at the Olympiad. However, to assess potential is tricky. Polgar is toward the end of her professional career, so her potential is already tapped. It is unlikely (but not impossible) that Polgar will enter the top ten again. The question is whether Hou Yifan can reach the top 10. Let us hope that Hou Yifan will not only look at Polgar as inspiration, but measure herself against the best players that ever played. That is what Polgar did and she has proved that a woman can have a brilliant career in chess. Hou Yifan is a bright star in chess. Let us hope that the Chinese federation and her parents determine the right path for her. I agree. There is no sign that Yifan is under stress to devote her time in her chosen passion. In chess, as in most sports, you cannot wait until the later years to start competing; you will have missed on your chance to stand out. Anytime you’re set apart with a gift, you will also have to forgo a lot if you truly want to make good on your given talent. Nothing is for free! Hou Yifan just played in the Hainan Danzhou Chess Tournament and scored 3/11 amongst an all-GM Chinese field… dead last. Let’s hope she breaks out of her slump soon. To see all of them, you have to be logged in and choose ‘SEE ALL’ of the ‘recent posts by others’. All good wishes for The Chess Drum from Sri Lanka. You are obsessed by an evil spirit who tells you that humans and especially women can be judged like a technical device or a working animal. Like my friend Ven. Nyanaviveka has already given to understand very carefully, Hou Yifan or better Yifan Hou is beyond concepts. Before she was born, she has already been, she has always been the greatest, even before the creation of the world. You must look closely to understand. But the evil spirit is your hindrance. So you miss the core, you only see a racehorse that does sometimes well but sometimes fails to perform like a donkey (like Yifan during the last tournaments), or a Friesian cow that needs medical support to keep the milk yield and reproductive performance on the desired level. Your work with the home page is more than laudable because it offers a lot of valuable information, but your physical and psychological view of human beings seems to be somehow one-dimensional and simplified. Now I hope that we haven’t abused the hospitality on your home page too much. Since you seem to be a Muslim I hope that you will find an approach to the wonderful Sufi teachings that are very close to our tradition. This will help you to understand. i.m.o. Yifan Hou is not “better” than Hou Yifan because apparently she self-identifies as Chinese and Chinese people put the family name first. It’s a cultural thing, not just something done by the government. 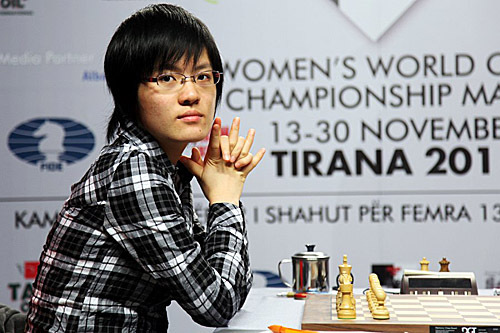 Her name is Hou Yifan. And Polgar’s name is Polgar Judit. Hungarians also put family name first similarly to the Chinese, but since they are dead alone with this in the western world everyone just flips their names to western order out of convenience. Cheers to Hou Yifan and Polgar Judit. You are most welcome to express your views here, but we are discussing chess here. What you may be missing is that this is not a dissertation of the metaphysics of creation and that which expresses the totality of one’s existence before birth. We are simply discussing chess on this page, not religion, nor metaphysics, nor creationism. Not whether Hou Yifan (or Judit Polgar) is or is not inherently flawed or whether she is a perfect creation. It appears to me that this is beyond the scope of what this discussion is about. I am not certain whether or not you play chess since you do not mention it, but these discussions on performances of various players whether it is Bobby Fischer, Garry Kasparov, or Viswanathan Anand are very common. In fact, you will find these discussions in any practical sport whether cricket, football, tennis or basketball. The notion that one’s need religion or metaphysics to understand performance leads me to believe that you have missed the mark on the nature of these discussions. There are many websites for discussing religion and metaphysics, but here we are only discussing chess skill, chess results and chess performance of players. Chess as a sport certainly has a metaphysical aspect and I have written essays on this, but we are not entering debates about the metaphysical reality of creation and whether or not everyone is perfect because of a predetermined destiny. No, no, no, you get it completely wrong. No ‘dissertation of the metaphysics of creation’, no ‘metaphysical reality of creation’, and first of all no ‘predetermined destiny’. Nothing of that, it’s completely the wrong track. I see, you have a different approach to life. That is no problem there is nothing to criticize about that. Since there is a lot of influence of Zen Buddhism on our modern society – many chess players are meditating to strengthen their concentration – I did not expect that you have no appreciation for these things. But it doesn’t matter. My intention was only to give an impulse to look on the game of chess in a more creative way. Maybe later in your life you will find a book about Zen Koans, this will help to avoid misunderstandings about my thoughts concerning Yifan and Judit. In the meantime I will not bother you and your visitors anymore. Ratings and titles are important – there is no doubt about that. However, it speaks for you that you publish these thoughts even though you have no sense for the subject. With some amusement I have followed the ongoing discussion. Respect for Daaim Shabazz for his neutral moderation and his patience. As a Buddhist monk I would like to add some final reflections to the article of Magister Ludi. Maybe his philosophical thoughts are useless since they can’t be understood by the majority, but the essence of his words is constructive criticism. I think it should be highlighted that the World Chess Championship 2012 took place in the State Tretyakov gallery that possesses a unique collection of Russian art. Even the Fédération Internationale des Échecs has realized that chess can win much more friends for example in the intellectual circles of art lovers. The combination of Chess and Zen seems to be even more promising. There is no need to discuss the benefit of meditation. There are many chess players who use Zen to improve their concentration and especially their intuitive skills. FIDE seems to understand that chess could enrich the life of much more people if it is presented in the right context. But this doesn’t seem to be the subject of this home page. So we redirect our attention to the actual results and ratings. These days we have the FIDE Women Grand Prix in Kazan, Russia. After a draw in the first game and a loss in the second round against Betul Cemre Yildiz (Elo 2333!!!) yesterday Yifan has won her third round match against Tatiana Kosintseva. I could follow parts of the match; the Keres attack of the Sicilian defence was played. Yifan played very dynamic and won the game in her usual expressive manner. So don’t panic, there is still hope. Epilogue: In the middle of these difficult days with endless losses she looks even more beautiful. She IS the greatest, there is no need to achieve something. I agree with your premise on the benefits of chess. In fact, chess is a form of meditation. One of the aspects of chess I enjoy is the self-introspection. Apart from one’s religious submission of prayer, one can “see” their thoughts and thus, see imperfections (i.e., impatience, indecision, impulsiveness, sluggishness). This allows us to remain humble and to strive for improvement in our daily lives. We derive different benefits from chess and all of us have different reasons for playing. Some play for income; some play purely for sport; some play for self-awareness, introspection and meditation. Hou Yifan is developing and of course, improvement is not linear. No one can continue to improve infinitely in chess. She will have her losses and wins. The lessons we can draw from predecessors is that self-introspection is the key to understanding one’s path to success. When we deeply analyze our games, we are engaging in self-analysis in the quest for balance… truth. The truth of chess and perhaps the truth in our own being. On very basic level, perhaps she may have a different path of greatness. Achieving “greatness” in chess is something we normally associate with a few people. However, each of us has a purpose in life and chess has the ability to bring us closer to that goal. Hou Yifan’s loss to Yildiz was indeed surprising, but these experiences will keep her humble and striving for whatever greatness she is seeking whether it is in chess or some other endeavor. May you be well and protected on your way. She’s a very pretty girl. I like this one. While reading about her career I became more and more enchanted by the charm of the story of Yifan Hou and her parents. So I decided to offer her some free time and to share the collected material with other people who are interested in this modern fairy tale with Yifan’s parents giving up everything for an illusion, just to see their little daughter smile. Despite all the limitations of Facebook, the result is now available on two pages. To learn more about the milestones of her chess career you can choose the only illustrated presentation on the Internet: http://www.facebook.com/pages/Yifan-Hou-ChessCareer/361122587286670. A more private approach to her life offers a beautiful collection of photos with quotations from her interviews: http://www.facebook.com/pages/Yifan-Hou-PhotoGallery/433252553375689. May you be well and protected. Many thanks for your articles about the arrest of Garry Kasparov. He seems to have many enemies even in the chess blogs. However, for me he is still THE hero. Good luck for you and The Chess Drum. Hou is all of, what, 18? I’m pretty sure she has some time to progress to 2700. She’s definitely in the right country to do it. I’d be willing to wager that she’ll make it if she doesn’t leave top-level chess for other pursuits. She turned 19, but she has to decide whether she is going to play the strongest competition or continue playing women’s chess which will inevitably damage her stability. After the losing the women’s championship recently, she went into a long slump before rebounding. She fared decently in the Tata Steel tournament 5.5/13, but she is still not beating elite players regularly. Starting at age 17, Polgar was beating top-ten players on a regular basis. There is still time for Hou Yifan to make 2700, but I doubt it she will reach #8 as Polgar did.